The younger brother of Beauford, Joseph Delaney was born in Knoxville, Tennessee and was raised in a household governed by his father, a Methodist minister. After high school, Delaney lived the life of a homeless traveler in his late teens and twenties before serving three years in the Eighth Illinois National Guard. 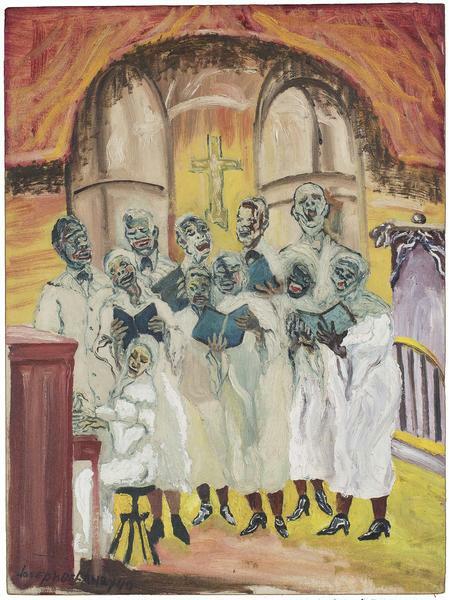 In 1930, he decided to become a professional artist like his older brother and moved to New York City, where he studied at the Art Students League with Thomas Hart Benton and anatomist George Bridgeman. Joseph Delaney’s time at the Art Students League had a profound effect on his artistic development, and he resolved to commit himself to a more populist art, depicting the vibrancy of American life. 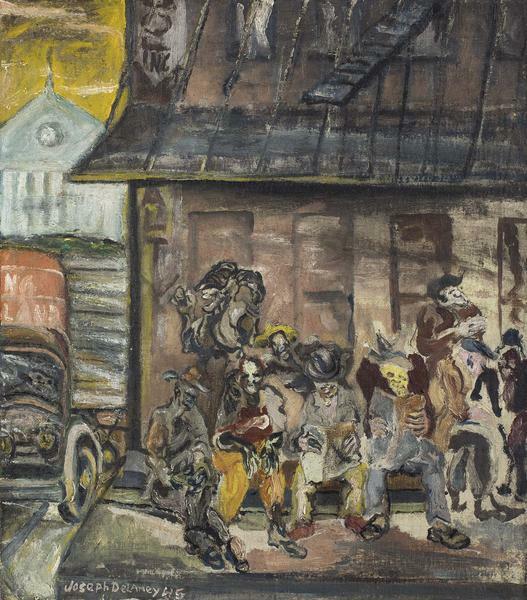 During the Great Depression, he painted numerous portraits on commission, was employed by the WPA (1936-1939), and exhibited yearly in the Washington Square Park Outdoor Art Show. Known for densely narrative paintings focusing on New York City’s people and places, Delaney was drawn to the human figure and the events, struggles, and triumphs of ordinary existence. In 1968, he summarized his experiences as a New York artist in a small pamphlet entitled, Thirty-six Years Exhibiting in the Washington Square Outdoor Art Show. In 1985, Delaney returned to Knoxville to live out the remainder of his life. 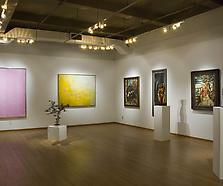 He stayed an artist in residence at the University of Tennessee, which mounted his first retrospective in 1986. While Delaney was well known in Tennessee, the 2006 traveling exhibition Life in the City: The Art of Joseph Delaney helped him achieve greater national recognition.